Waterton Lakes National Park and Glacier National Park together form the world's first International Peace Park. Waterton has an amazing diversity of wildflowers and wildlife. The area is famous for its profusion of wildflowers in the summer and sightings of bear, elk, mountain sheep, and eagles are common along the parkways. There are a wide variety of trails for hiking, from a short stroll to an overnight backpack and many lakes and waterfalls to see. The Waterton Area is a beautiful part of Southwestern Alberta. It is where the prairies meet the mountains. Some places to visit include Waterton Lakes National Park, Castle Mountain Ski Resort, Remington-Alberta Carriage Center, and the museums of Pincher Creek and Cardston. Area activities include skiing, hiking, golfing, and sight-seeing. Annual events include the Castle Mountain Ski Festival, Cowboy Poetry Gathering in Pincher Creek, and fairs and rodeos in Cardston and Pincher Creek. 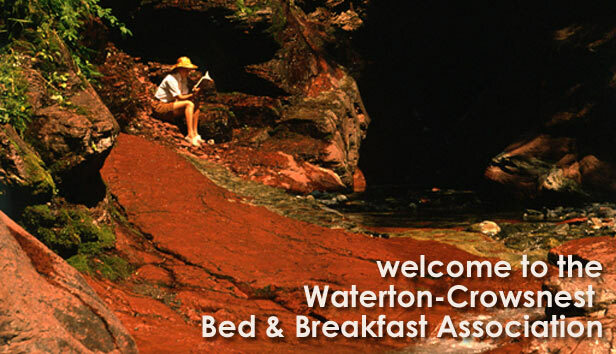 Alberta Bed and Breakfast Association. All photos appear courtesy of Travel Alberta and the Pincher Creek Echo. BBCanada.com is not responsible for the accuracy of information supplied by subscribers. By using this web site, you agree to our terms and conditions of use.